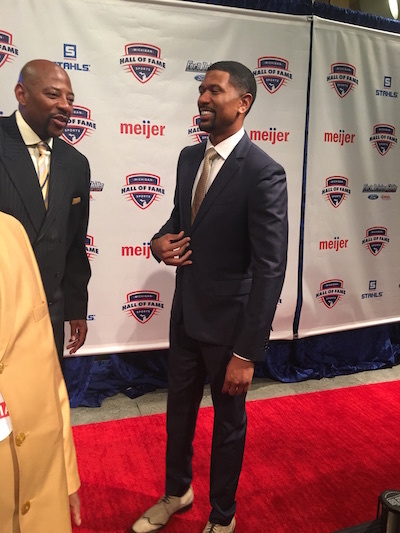 Former NBA star and current ESPN analyst/commentator Jalen Rose was recently inducted into the Michigan Sports Hall of Fame. Lance Martinez of My Detroit Sports was on hand and sends along this original photo of Rose from the induction ceremony held at midtown Detroit’s Fisher Music Center. This gala event also featured former NFL star wide receiver Andre Rison, Fab 5 teammate Jimmy King and former Tigers manager Jim Leyland. The 44-year-old Rose attended Detroit’s Southwestern High School. The now closed educational institution sat five miles west of downtown Detroit. Rose, who played for several NBA teams from 1994 through 2007, is very well known for being a member of the Michigan Wolverines Fab 5 teams of the early 90’s. Rose, along with Chris Webber and Juwan Howard made up the core of arguably one of the most famous college basketball teams of all-time. The trio led the Wolverines to consecutive Final Fours in 1992 and 1993, losing to Duke and North Carolina in the ’92 and ’93 title games respectively. Rose remains one of the most frequently chronicled athletic figures on iFolloSports.com. Check out the bevy of content Rose has been a part of, over the last few years.